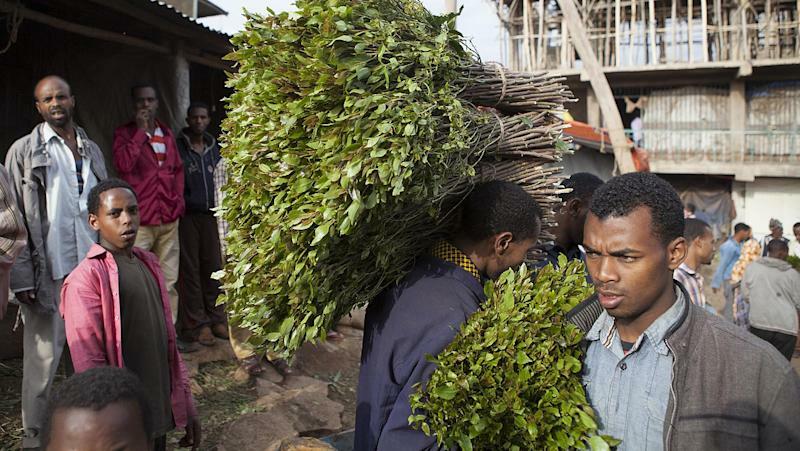 Awaday (Ethiopia) (AFP) - For a town seen as a key trading centre for khat, a drug that is banned in many countries, Ethiopia's Awaday can seem pretty drowsy and laid-back. As the sun sets on the small eastern town, farmers and brokers of the amphetamine shrub rouse from an afternoon slumber to cut deals in the bustling market, one of the busiest centres of international trade for the leaves. Khat, a multi-million dollar business for countries across the Horn of Africa and in Yemen, consists of the succulent purple-stemmed leaves and shoots of a bush whose scientific name is Catha edulis. Chewing it for hours produces a mild buzz. 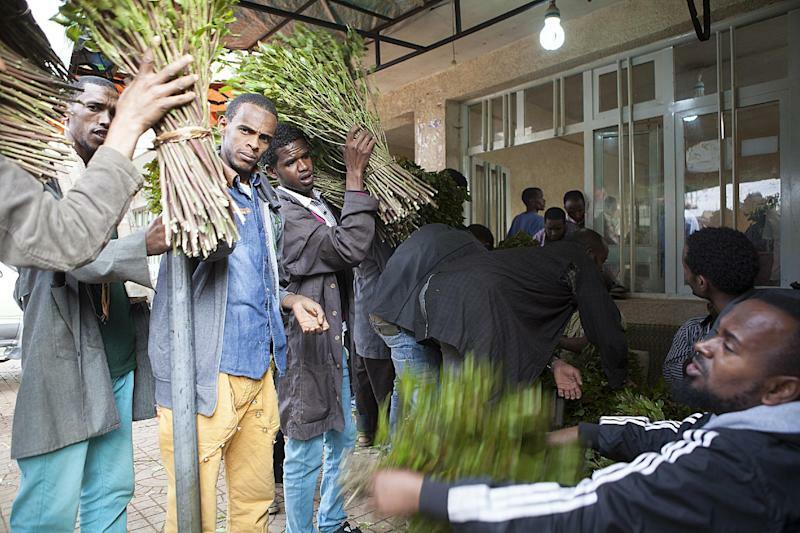 But Britain in June classified khat as an illegal drug, closing the last market in Europe in the wake of a similar ban by The Netherlands in January. For the thousands of farmers and traders here in Awaday, 525 kilometres (325 miles) east of the Ethiopian capital, the ban has already had a severe impact. Previously the plant was Ethiopia's fourth largest export, earning more than $270 million (205 million euros) in 2012-13. "All of the people, they are in big trouble, even the man who brings from the farm to the market, and the guy who buys from here to export," said exporter Mustafa Yuye. "For most of the people here, their living is by khat, they don't have other jobs," he added, speaking after an early morning shift at the manic market, where several tonnes of the herb change hands each day. For first-time chewers, the bitter leaves -- stuffed in a squash ball-sized bulge in the cheek for several hours -- offer little more than a sour taste, a sore jaw and the sensation that one has drunk several pots of coffee. The UN World Health Organization says the plant causes irritability, insomnia and lethargy. More experienced chewers describe a meditative, almost trance-like state, where one's sense of time slips away. The user may sit still for hours, yet remain alert to conversation or reading matter. While debates about khat's effects on health go on, around 20 million people across the Horn of Africa and the Arabian Peninsula chew the plant every day. In Ethiopia, where khat is intertwined with ancient traditions -- Muslim clerics chewed it to help them study the Koran -- the shrub is legal. Crops are now sold to neighbouring nations, especially Somalia and across the Red Sea to Yemen. Khat must be chewed fresh because its potency fades within hours. After frantic trading, drivers pile bundles into airplanes or pickup trucks, dashing along dirt tracks at breakneck speeds for wider distribution. Before the ban, Mustafa sent more than three tonnes a month to the Horn of Africa diaspora in Britain, but he is now restricted to supplying domestic and regional markets. Prices have tumbled. "Our money is getting less," Mustafa said, and farmers in Kenya share similar concerns. 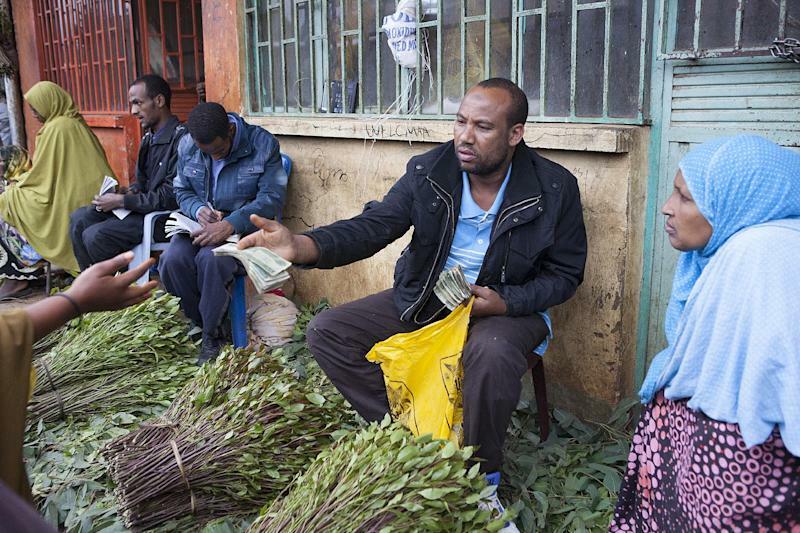 Brokers like Mustafa can earn up to $30 (22 euros) per kilo (2.2 pounds) in the top markets, but as little as $5 (three euros) for the same quantity of low-grade khat in regional markets, according to local traders. Redundant khat broker Tofiq Mohammed said the whole town of Awaday will be hit by the ban. He used to sell two tonnes to Britain a month but has now stopped working. "From the farmer to the traders, we are in trouble without work," he said. Some farmers had switched to khat from crops like coffee or maize, because khat can be harvested year-round and previously fetched stable prices at the market. Kadija Yusuf, surrounded by her chest-high bushes, says she preferred khat farming since it needs less water than coffee. "There was not enough water, so I started growing khat," Kadija said. "If they don’t allow us to export... we will stop this and return to coffee." Her earnings were low -- about $38 (28 euros) in a good month -- and she worries that her income will now drop further. With prices falling it is cheaper to chew, but critics say that for those hooked on the leaves, the habit squanders their cash and time. "When you chew khat you focus, you read a lot," said Adil Ahemmed, sitting on the floor surrounded by friends and piles of khat stalks, while coffee beans roasted over a flame. But he calls chewing a "social addiction", and admits it is draining his money. He spends about six euros a day on the plant, about 90 percent of his earnings as a computer technician. "Economically it damages us," Adil said, his cheek packed with leaves, swollen like a hamster. "That’s the biggest problem, especially for youth."